Identifying biases and assumptions, and defining scope and goals of foresight tasks. Mapping, monitoring, and learning from a system, its events, and info sources. Finding, prioritizing and extrapolating data, drivers and uncertainties. Identifying implications, challenging assumptions, and engaging in strategic thinking. Turning strategic vision into actionable steps, measures, and processes. Executing agendas, implementing intelligence, and institutionalizing foresight processes. These categories are convergent on action, and it is also implicitly a cyclical model. As with Eltville, the categories don’t have to proceed in an exact order, and it can take days, weeks, or months to implement the full cycle with clients. Framing alone, negotiating the type of foresight work that the consultant or internal foresight group will do for the client, can easily take weeks to months for complex foresight projects in large bureaucratic organizations. Making that first Framing step explicit, and stressing its importance in the ultimate success of any foresight project, is one of the many benefits of this model/framework. See Thinking About the Future for implementation details. 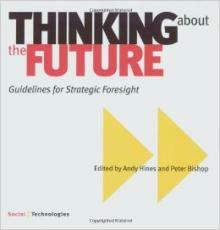 The book includes many brief case studies on foresight projects. It is a great addition to your practice library and an excellent complement to this guide.